As SAP HANA might not only a database for selecting and inserting operations you can use the HANA itself for modelling in-memory business scenarios. The advantage is a further significant performance improvement due to a complete in-memory calculation. For example massive data calculations. 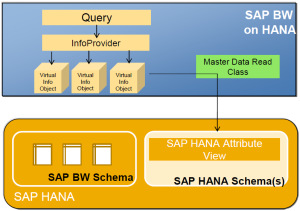 You can do the calculation as start routine in SAP BW on HANA. 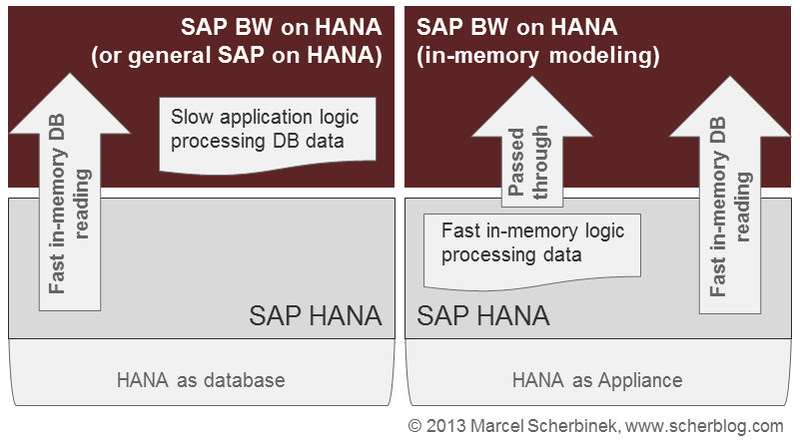 The data for calculation will be selected fast due to the SAP HANA in-memory database but the calculcation in the start routin has nothing to do with in-memory: it happens on the SAP BW application server. Alternatively you can push the calculation in a SAP HANA model. 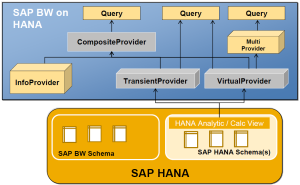 The application server SAP BW will just receive the results. The results can be migrated in SAP BW on different ways. Either by virtual data providers or by virtual master data provider. 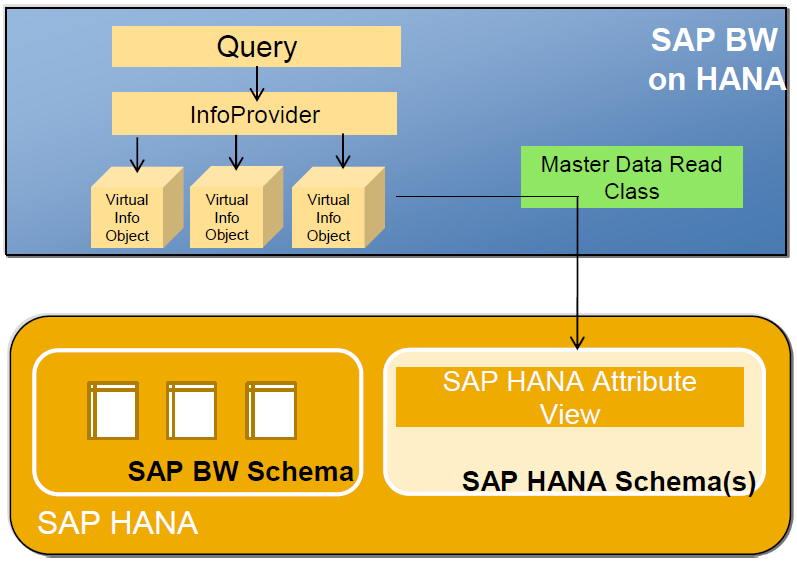 Due to a complete calculation in-memory retrieving the data from SAP HANA models will be always virtual. I prefer using the Virtual Provider as you can use your already created InfoObjects with their attributes and texts (attributes of an InfoObject must be assigned as well from the SAP HANA model!). 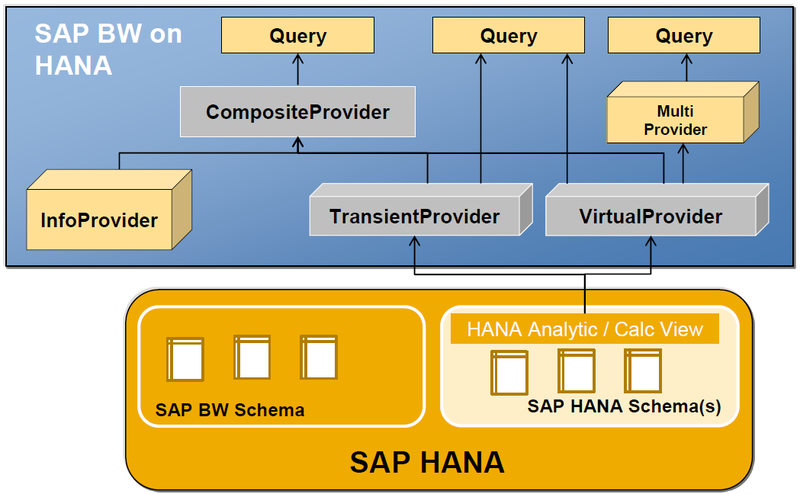 You can use as well a Transient Provider which will create temporary InfoObjects based on you SAP HANA model. Both Providers can be included into the Composite Provider but only the VirtualProvider can be used in the classical MultiProvider. The CompositeProvider has the advantage that it can JOIN the Provider whereas the MultiProvider simply UNION the Provider. A further improvement is not only building SAP HANA models but to create performance oriented procedures or models in SAP HANA. Similiar the same as you would do in SAP BW. Therefore you can boost your performance and you will receive the full power of SAP HANA. 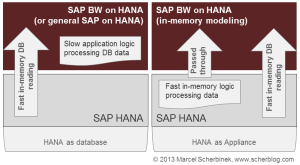 Of course, SAP BW on HANA might be one example as exactly the same ca be done for a SAP ERP on HANA. Maybe not for analytics but also for fast calculations which will be inserted in a DDIC table for a SAP application for SAP ERP.